Discover New Zealand's North and South Island with must-sees all the way, from the cityscapes of Auckland to the barren landscapes of Desert Road, serene Milford Sound to the jagged pancake rocks of Punakaiki. Visit Te Papa, the Museum of New Zealand, and learn about traditions of the Maori. Learn from a jade (greenstone) carver and an expert guide in the Waitomo Glow Worm Grotto. City tours in Auckland, Wellington, Blenheim, Dunedin. Visit Parry Kauri Park, the Bay of Islands, Punakaiki Pancake Rocks and Franz Josef Glacier. Welcome to Auckland! On arrival you will be transferred to your hotel (flights to arrive prior to 4pm). 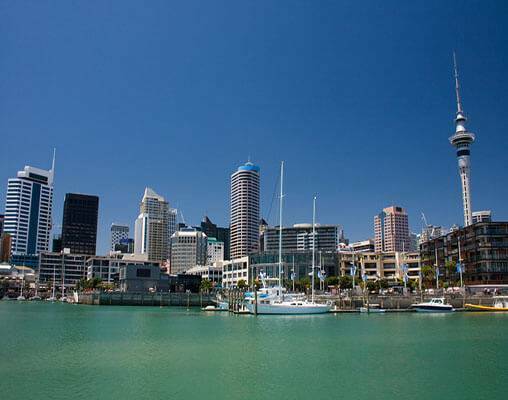 You're free to explore Auckland before an evening Welcome Reception with your Travel Director. Enjoy a Welcome Reception meal and accommodations at The Langham. Journey through Orewa and along the scenic Hibiscus Coast. Enjoy a stop at Parry Kauri Park then it's on to Whangarei, the northern-most city in New Zealand. Your final destination is the Bay of Islands. 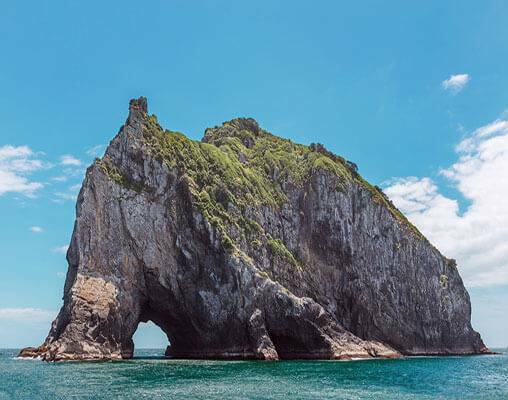 Experience natural wonders and spectacular scenery as you cruise to Cape Brett and through the 'Hole in the Rock'. Enjoy a buffet breakfast, dinner with wine, and accommodations at Copthorne Resort. Today your choice of sightseeing: discover the new wine-producing of Kerikeri; take a tour to historic Russell; go sailing on a tall ship; take a dolphin-watching cruise on the bay; or enjoy a scenic cruise on the Waitangi River. Enjoy a buffet breakfast as you continue your stay at Copthorne Resort. Relax this morning before you return to Auckland. This evening join your Travel Director for a meal at 'Eight' at The Langham. Your personal degustation is prepared for you from the freshest, quality ingredients, including mouth-watering seafood and delicious desserts. After a sightseeing tour of Auckland, head south to visit the amazing Glow Worm Grotto. A specialist will lead you through the grotto by boat and you'll walk in the limestone caves. Continue to Rotorua. Tonight experience a Maori Hangi feast and concert at the Tamaki Family Marae and accommodations at the Millennium Hotel. Today your choice of sightseeing: join the Kiwi Encounter at Rainbow Springs Nature Park; discover Maori culture at Te Puia Maori Arts and Crafts Institute; see the Agrodome Sheep Show; relax in the seclusion of your own hot mineral pool; unwind with a facial treatment in the Lake Spa Retreat at the Polynesian Spa; ride the amphibious Rotorua Duck or the luge at Rotorua Skyline. Enjoy a buffet breakfast as you continue your stay at the Millennium Hotel. View Huka Falls and drive along the shores of Lake Taupo. Discover the alpine scenery of Mt. Ruapehu, Tongariro National Park and the dairy farms of Manawatu. Visit Shenandoah for an afternoon tea. The historic villa's owners, Simon and Claudia, will show you around their property, which includes a unique private collection of Harley Davidson motor cycles. Take a short tour to see the local wildlife then continue to Wellington. Enjoy a buffet breakfast, dinner with wine, and accommodations at the James Cook Grand Chancellor. Visit Te Papa, the Museum of New Zealand, for a Cultural Insight into Maori life. Later, cruise the Cook Strait into tranquil Queen Charlotte Sound. The seaside village of Picton is next, then Blenheim. This evening enjoy a 5 course Regional Meal prepared with local produce, paired with wine from the famous Marlborough region. Enjoy a buffet breakfast and accommodations at the Scenic Marlborough. En route to the whale-watching haven of Kaikoura, you'll see New Zealand fur seals up close at Ohau Point. Travel over the Canterbury Plains to Christchurch. Enjoy a buffet breakfast and accommodations at Novotel. Join us for a taste of country life at a Be My Guest barbecue lunch on Morelea Farm, a typical working sheep farm. You'll be welcomed into the home of your hosts Angie and Stan Taylor and their 600 acre garden. Hear their stories and sample delicious food prepared just for you. Later see Lakes Tekapo and Pukaki, visit the Church of the Good Shepherd and soak up the alpine scenery of Mount Cook National Park. Enjoy a buffet breakfast, dinner with wine, and accommodations at MacKenzie Country Inn. Drive along the Waitaki River and view the Hydro Power Scheme and Benmore Dam, then through Oamaru to Dunedin for a tour of the city. Enjoy a buffet breakfast, dinner with wine, and accommodations at the Scenic Southern Cross Hotel. Today your choice of sightseeing: tour Larnach Castle; ride the historic Taieri Gorge Railway; take the Monarch Wildlife Cruise; tour Cadbury World or Speight's Brewery. Later, cross rich fertile sheep-filled farming land to Te Anau. Enjoy a buffet breakfast, dinner with wine, and accommodations at Distinction Hotel. You'll be awe-struck by the magnificence of the World Heritage Fiordland National Park. Your cruise on mystical Milford Sound will take you past Bowen Falls and Mitre Peak. Afterwards, travel over the Devil's Staircase, along the shores of Lake Wakatipu on your way to Queenstown. Enjoy a buffet breakfast and accommodations at the Millennium Hotel. Today your choice of sightseeing: ride the Shotover Jet boat; join a wine tour; play 9 holes of golf; ride a gondola to the Skyline Restaurant for dinner; take a 4WD minibus excursion through Skippers Canyon. 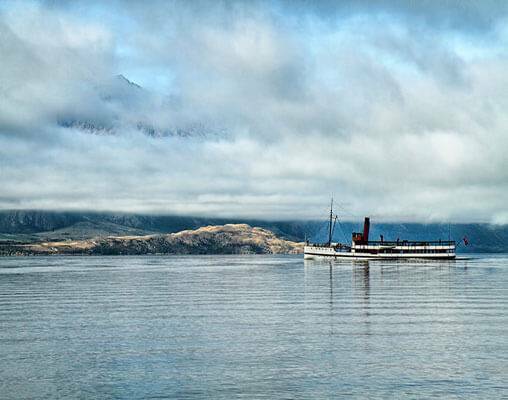 This evening cruise across Lake Wakatipu aboard New Zealand's oldest steamship, the TSS Earnslaw, to Walter Peak High Country Farm for a Regional Meal at the Colonel's Homestead. Enjoy an entertaining sheep show between courses and later return to Queenstown to sample the festive nightlife. Enjoy a buffet breakfast as you continue your stay at the Millennium Hotel. Visit the historic gold mining village of Arrowtown. 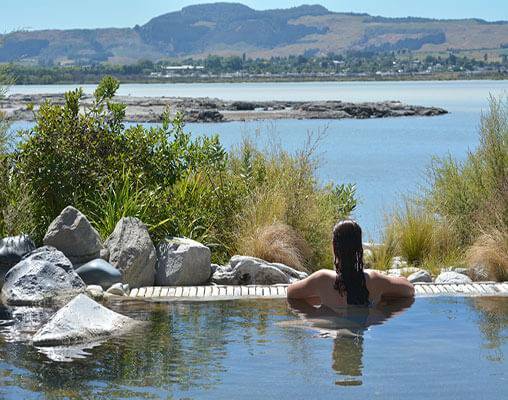 Enjoy the tastes of delicious stone fruit at Cromwell then see a trio of lakes, Dunstan, Hawea and Wanaka. 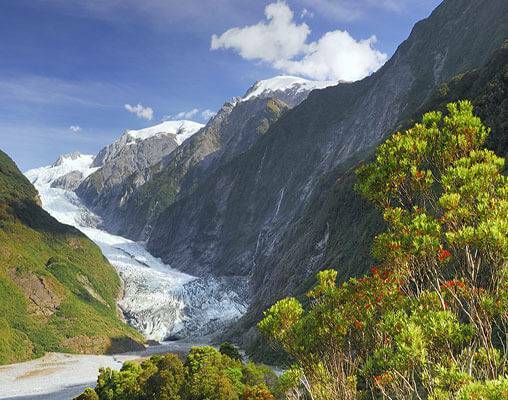 Travel over the Haast Pass and on to Franz Josef Glacier. Enjoy a buffet breakfast, dinner with wine, and accommodations at Scenic Franz Josef Glacier Hotel. There's time to explore Franz Josef Glacier. Later, take a walk among rainforest giants on the West Coast Treetop Walkway. Depart for Hokitika, home of the native greenstone (jade), for a factory visit and jewellery demonstration with a Local Specialist. 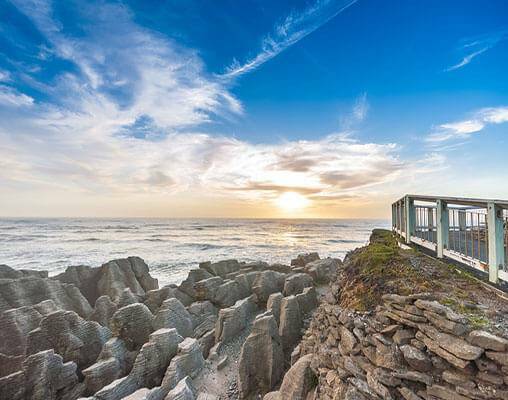 Later, travel to Punakaiki for a night in your eco-friendly resort right on the waterfront. Enjoy a buffet breakfast, dinner with wine, and accommodations at Punakaiki Resort Authentic. 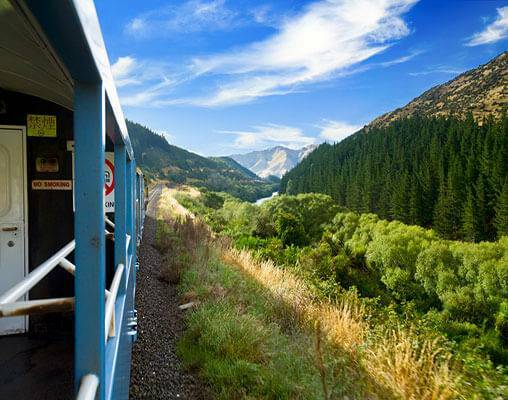 Board the TranzAlpine train and travel through the Southern Alps to Christchurch. Celebrate your trip with a Farewell Dinner and accommodations at Novotel. 27th April 2019 $6,025 Please call for availability. Enter your details below if you would like to be notified when 2021 dates and prices are available for Best of New Zealand. Note: Airfares are not included in the prices above. Please ask your rail specialist for the air pricing. Additional departures may be available, ask your rail specialist for details.